On Saturday night the Middle East witnessed another remarkable demonstration of the spirit of democracy. Over 450,000 people, 6% of Israel’s entire population, were out demonstrating against government policy. That’s the equivalent of almost 19 million marching throughout the USA, over 2 million in Canada, and nearly 4 million people walking peacefully in the streets of the UK. No one shot at them, or kettled them, and the police were even on hand to help. 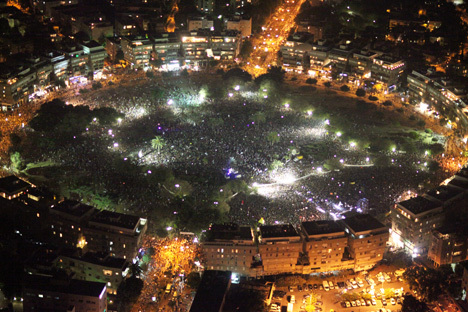 What’s more, the largest demonstration for social justice took place in the State Square, home to the most expensive luxury boutiques in all of Israel. After the rally the 300,000 protesters went home, leaving zero shops damaged. For the full translation of Daphne Leef’s speech at the Tel Aviv rally, click here, and for some opinions click on our blogs.